Audi Q7 is not really a player in the big-league, high-powered SUV game, and that’s something German tuner ABT Sportsline just cannot handle. So they took matters into their own hand and came up with the ABT Audi SQ7 which has enough power to at least challenge the authority of the likes of Cayenne Turbo, GLE 63 AMG and X5M. This big bad SUV packs a very respectable 520 horsepower and 970 Nm of torque, which is remarkable because a. it comes from a TDI diesel motor, and b. the standard output is 435 hp and 900 Nm. So the gain in power is massive and so is its effect on the performance of the two and a half ton SUV. 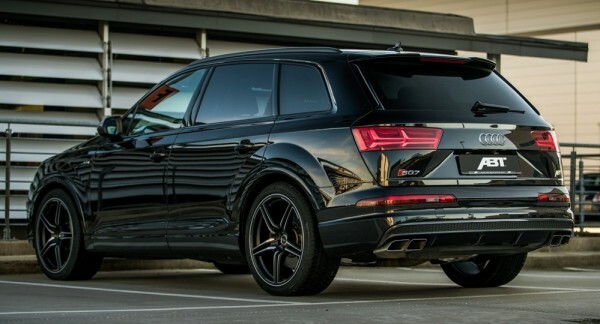 ABT Audi SQ7 can sprint from 0 to 100 km/h in 4.6 seconds and it will sound fast too thanks to ABT sound control module that works wonders for the diesel engine. As per usual, the tuner has left the body largely untouched and seeks enhanced style through the use of lowered suspension, some black-out exterior parts, in this case fender inserts, and some nice wheels. 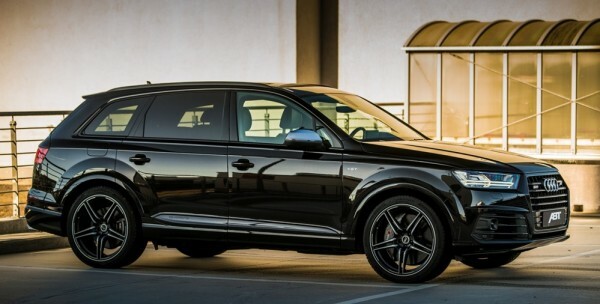 The ride height on ABT Audi SQ7 is lashed by 20mm with ABT Level Control module and as for the wheels, the recommend setup is DR or FR series in 22 inch size wrapped with Dunlop or Continental high-performance tires and, of course, black finish.